Saath Charitable Trust (SCT) was founded by Rajendra Joshi in 1989, at a time where there were very few organisations working for the upliftment of slum dwellers. SCT, therefore, decided that its larger focus would be urban slums. Today, Saath reaches out to almost 200,000 slum dwellers, addressing multiple issues – livelihoods (being the largest), education, health, affordable housing, information and access, child rights, women’s empowerment, re-settlement and rehabilitation, youth aspirations and access to savings and affordable credit. SCT is the recipient of several awards and accolades, the most recent of which include the India NGO Award (2010 and 2011, Western region), the Edelgive Social Innovation Honours 2011 for the Urmila Home Manager Program, the Accenture South Asian Network’s Charity of the Year 2011 and the Indian Social Entrepreneur 2009 by Schwab Foundation, UNDP and CII. Total Income: The total income raised by SCT in FY13 amounted to Rs38.6mn, which is around 16% less than the Rs46.2mn raised in FY12. 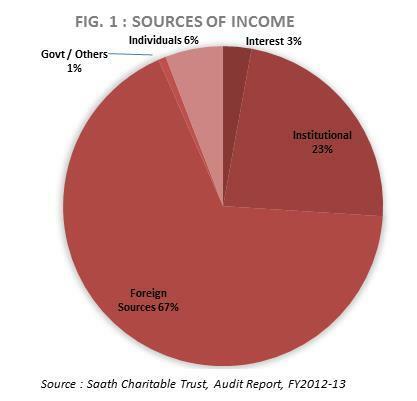 SCT largely receives funding from institutional donors, both local and foreign, the amounts received from each in FY13 being Rs8.9mn (23%) and Rs26mn (67%) respectively. This is a unique funding pattern, where over 90% of funds are raised from institutional funding agencies (Ref: Fig.1). The next biggest sources of funding are individual donors, at 6% of total income (Rs2.3mn) and interest income being around Rs1.1mn (3%). 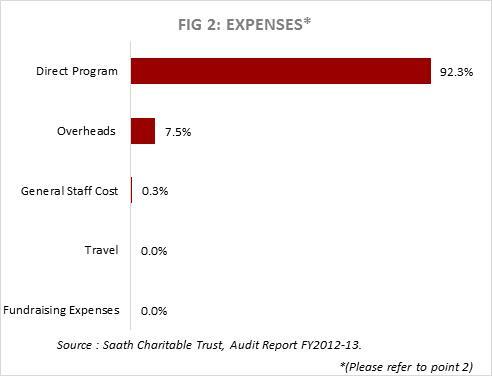 Spend on Programs vs. Overheads: Prima facie, SCT directed 92.3% (Rs37.5mn) of its spending in FY13 towards direct program-related activities, and 7.5% (Rs3mn) towards overheads (Ref: Fig.2). It may be noted in this regard that expenditure has been presented project-wise in the audited financials, without granular expense wise bifurcation. Expenses have been broadly classified under the heads of Program Cost, Program Staff Cost and Program Admin Cost. In the absence of further classification, we have relied on these numbers for the purpose of our analysis, and have accordingly not been able to ascertain the exact quantum of expenses on administrative staff salaries, travel, fundraising, etc. Earmarked and General Reserves: Earmarked Funds stood at around Rs10mn at the end of FY13, while general reserves amounted to Rs3.5mn, after adjusting the FY13 deficit of Rs2mn. 67% of the earmarked funds are towards the ‘Disaster Mitigation Fund’ (Rs6.8mn) while the rest are mainly for the purposes of asset acquisition, administration and program innovation. The organization has a large amount of unutilized grants (Rs9.3mn) reflected in the books of accounts for FY13. Fixed Assets: Fixed assets held by SCT amounted to Rs2.7mn, of which Rs0.6mn is on account of immovable assets in the nature of building. Current Assets: Current assets amounted to Rs6.2mn at the end of FY13, the main components of which include a loan to Saath Saving & Credit Co-op Society (Rs3.5mn), TDS receivable (Rs1.4mn), rent deposit (Rs0.4mn), livelihood advances to rickshaw drivers and weavers (Rs0.3mn) and deposit with the municipal commissioner (Rs0.3mn). Investments: SCT has a large portfolio of investments, amounting to Rs14.2mn at the end of FY13. The investments are all in the nature of fixed deposits with banks, 49% attributable to program funds and 51% to general funds. Additionally, savings bank balances amounted to Rs4.3mn as on the same date. Loans: Unsecured loans outstanding amounted to Rs3.5mn as on the FY13 year-end, which is unchanged from the FY12 balance. Income Growth Rate (IGR): The IGR of SCT was a -16.4% in FY13, coming down from the +15.4% of FY12. The IGR has been erratic for SCT over the past few years. This could mostly be owing to the fact that most funding is received in the form of grants from institutional donors, and unutilized grants in any year are not included as income, in accordance with accounting best practices. This has an effect on the computation of annual IGRs. Self Sufficiency Ratio (SSR): The SSR measures an organization’s ability to raise funds from steady sources of income such as individuals, investment income, beneficiary fees, etc. The SSR of SCT in FY13 was low, although growing slowly from year to year, being 9% for FY13. This is due to the relatively low dependence on stable sources of funds such as individual donors and investment income. Corpus Fund: SCT has a very meagre corpus fund, amounting to Rs0.17mn. Considering the scale of the organisation, the amount is inadequate to cover risks of shortfall in funding in the near future, and is a concern from the viewpoint of sustainability. Meeting administrative costs: Like most NGOs, SCT finds it difficult to raise donor support towards office administrative costs like rent, general staff salaries, etc. Building the corpus fund: Similarly, it has been difficult to raise funds for the purpose of the Trust corpus as donors, particularly institutional donors, tend to prefer funding the direct program activities for immediate beneficiary impact. Setting up HR systems: SCT is at a stage where they require to set up organisational processes for human resource management. Due to budgetary constraints they are unable to access professional staff/consultants to put these processes in place. Founder Mr. Rajendra Joshi remains on the Board of SCT. The Board is chaired by Dr. Dinesh Mehta, Professor Emeritus at Centre of Environmental Planning and Technology (CEPT) University, Ahmedabad. Also on the Board is Mr. Sudhin Choksey, Chartered Accountant and Managing Director of Gruh Finance Ltd. Professor of CEPT (Faculty of Planning and Public Policy) Dr. Darshini Mahadevia and retired IAS officer Mr. Prabhat Ghosh also sit on the Board of SCT. SCT is registered with Credibility Alliance, Give India, Global Giving, Guide Star and World Charity Alliance.